Suns guard Eric Bledsoe drives to the basket against Warriors guard Stephen Curry during the first quarter Friday at Oracle Arena. OAKLAND, Calif. — Stephen Curry found other ways to contribute when his shooting skills let him down a bit. Curry had career highs of 16 assists and 13 rebounds to go with 14 points, and the Golden State Warriors beat the Phoenix Suns 115-86 Friday night for their fourth straight victory. "It’s very weird," Curry said. "Coming in to help the bigs I was able to snag a lot of rebounds early. I’ve never really done that at any level." Curry set the tone for the Warriors’ largest margin of victory since a 31-point win over the depleted Los Angeles Lakers on opening night. "He was spectacular," Warriors coach Mark Jackson said. "I love the way he competed. It was impressive the way he ran the team and kept his foot on the gas pedal." Curry said it was Golden State’s most complete game of the season. "We didn’t have any lapses," he said. "This is something we envisioned at the beginning of the season when we were all healthy." Klay Thompson scored 21 points and David Lee added 17 for the Warriors, who matched their longest winning streak of the season. Harrison Barnes and Draymond Green had 11 apiece. "It was good to get one of these wins," Lee said. "Phoenix is ahead of us in the standings. I love the way our team is playing." P.J. Tucker had 11 points and 12 rebounds to lead the Suns, who had won three straight and eight of nine. "It was total breakdown on everything," coach Jeff Hornacek said. "That’s the first egg that we’ve laid for the season. You’re going to have those games every once in a while. They really attacked us and we were slow to everything." Curry, who played 1 minute of the fourth quarter, had a rough shooting night and made just one of six 3-point attempts. He more than made up for it with his passing and rebounding for his third career triple-double. His 16 assists were the most by a Warriors player since Tim Hardaway had 19 on Jan. 8, 1990. "He did an unbelievable job," Lee said. "I thought he was having a decent night, but I didn’t realize how good until I looked up and saw the numbers." The Suns missed their final six shots of the first half, allowing the Warriors to open a 59-40 advantage heading into the break. Lee, who added seven rebounds, had his consecutive double-double streak end at 10 games. Andrew Bogut was held to six rebounds, ending his career-best streak of 10-plus rebounds at 10 games. The Warriors opened a double-digit lead in the second quarter and were never seriously threatened after that. "Their guards did a great job," Hornacek said. "Obviously, Curry with the triple-double. He’s got a great feel for the game. Even Klay Thompson got in a lot of foul trouble and still ends up shooting 9 for 11. They did a nice job." The Suns, who last played Monday, scored at least 100 points in each of their previous eight games and were looking for their longest road winning streak in nearly three years. Instead, they were handed their worst defeat of the season. 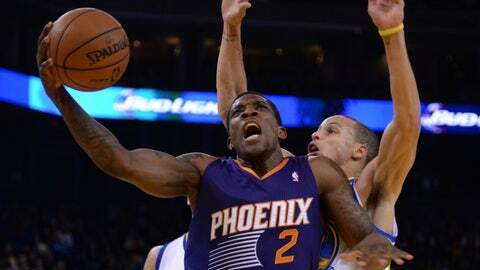 "I don’t know what it was," Suns guard Eric Bledsoe said. "We were just a step slow to everything they did. They were a step faster than us and we paid the price." The Suns were held to season lows in field goal percentage (.360) and 3-point percentage (.174). The game was tied at 10 midway through the first quarter. The Warriors never trailed after Curry hit a 3-pointer with 7:44 left in the period, and took a 28-22 lead into the second.